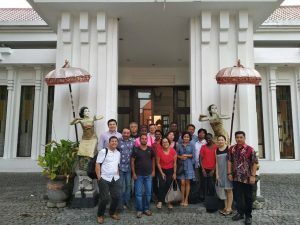 Bali, Indonesia – 22 organizations from Asia, Africa and Latin America, fresh off of a CSO planning meeting on the road to the 2nd High Level UN Conference on South-South Cooperation (BAPA+40 Conference)1, just launched the Southern CSO Alliance on South-South Cooperation. This is in light of the ambitious 2030 Agenda, which encourages development actors to step up their efforts to strengthen global partnership, including South-South Cooperation (SSC). The Alliance, spearheaded by The Reality of Aid Network and several members of the CSO Partnership for Development Effectiveness Working Group on SSC, was formed alongside other newly outreached CSOs planning to engage in the discourse after discussing the importance of BAPA+40 and the need to advocate for people-oriented principles such as horizontality and human rights-based approaches to SSC implementation. The Alliance was formed in CSOs’ fulfillment of their role as independent development actors, recognizing the need to ensure that SSC does not replicate the flaws of traditional North-South aid and development cooperation especially given that evidence show how practice do not live up to the principles of solidarity and equality on which it is anchored. Its rallying calls are for SSC actors to (i) adhere to international laws and standards on environment and peoples’ rights as these apply to programs and projects in partner countries consistent with Bandung; (ii) strengthen democratic country ownership and accountability of SSC and institutionalize support for people-to-people cooperation so that recipient countries’ own needs and priorities drive the development partnership; and (iii) establish formal mechanisms with financial resources for Southern CSO engagement on SSC where sustained dialogues between CSOs, stakeholders and duty-bearers can happen. The Alliance is an independent CSO/NGO group created to facilitate and coordinate CSO/NGO involvement and participation in SSC conferences and events, sustain CSO dialogues, and spearhead activities to enable CSOs and NGOs to engage in SSC processes. It invites all Southern non-governmental organizations (NGOs) and civil society organisations (CSOs) in developmental, humanitarian, and environmental spheres working on issues related to SSC. 1 The BAPA+40 Conference will be held on March 19-22 in Argentina on the occasion of the fortieth anniversary of the adoption of the Buenos Aires Plan of Action for Promoting and Implementing Technical Cooperation among developing countries (TCDC). It will review trends and lessons learned over the past four decades, with a view to implementing an inclusive strategy that effectively leverages South-South and triangular approaches to achieving sustainable development for all, leaving no one behind.